Some words about history of Planet Sun. 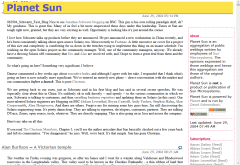 For round about six years Planet Sun has been an aggregation of public weblogs written by employees of Sun Microsystems. Though it never was a product or publication of Sun Microsystems itself. The website was powered by Planet and run by David Edmondson. On 01 Mar 2010 David decided to shut down Planet Sun, as Sun Microsystems did no longer exist – it’s now a subsidiary of Oracle. Btw, at planets.sun.com you will find Oracle Planets, perhaps you’ll find some interesting news or information there.